What should a Facebook Messenger marketer know about the GDPR? You’re in the right place. ✅ Everything you need to know about the European Union’s General Data Protection Regulation. 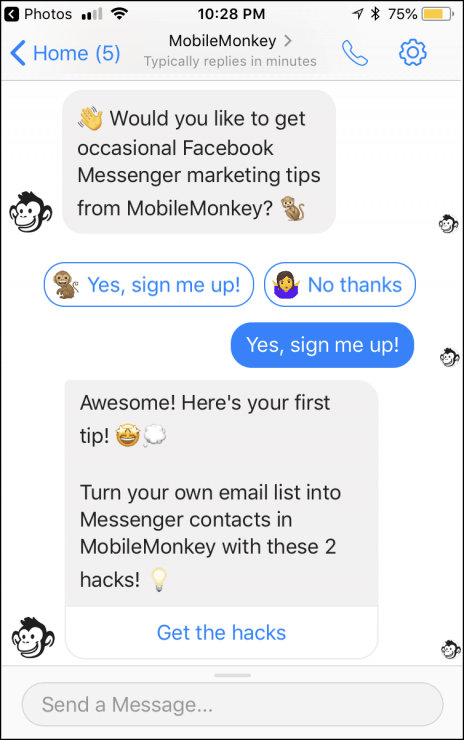 ✅ How marketers can stay on the right side of the law when using MobileMonkey’s Facebook Messenger marketing tools. I’m sure I’m not the first to explain the EU’s data privacy protection regulations to you. But for the sake of providing a comprehensive resource on Facebook Messenger marketing and GDPR, we’ll start with some definitions. The General Data Protection Regulation (GDPR) applies to companies doing business in the EU or handling personal info of EU citizens. Consensual — you need to get users’ express consent to message you. Secure — no personally identifiable info should get into the wrong hands. Removable — honor unsubscribe and delete requests. So that’s the GDPR, and there’s GDPR compliance built right into the Facebook Messenger system. Facebook Messenger has its own set of rules, with both some logical overlap and unique requirements due to the nature of the platform. What Are Facebook Messenger’s Rules? When we’re talking about being a rule-abiding Messenger marketer, we should keep Facebook rules for messaging in mind. Facebook has an FAQ on the Messenger Platform and the General Data Protection Regulation that outlines things like who is a data controller and who is a data processor. To be honest, there isn’t much helpful info there to regular marketers. They mostly suggest you talk to your lawyer. 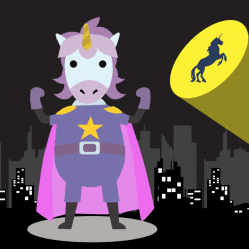 Practically, MobileMonkey users should follow these four rules for Messenger marketing. 1. 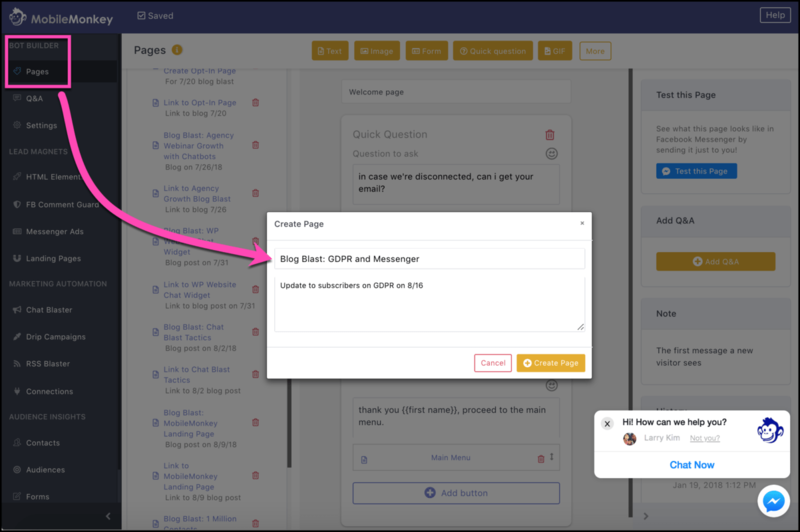 Getting messaging opt-in: When a user messages a Facebook Page, that page can send a follow-up automated response. Then what happens? Two important Facebook Messenger guidelines take effect: Facebook’s 24-hour messaging window (the “24+1 rule” for short) and subscription messaging. 2. The 24+1 rule: This is a Facebook guideline to curtail spam in the channel. When a user messages a Page, that Page can send any manner of messages to the user for 24 hours. After that first 24 hours is over, the Page can only send 1 message that is promotional, or meant to result in a sale. Any user-instigated interaction restarts the 24-hour clock. Facebook’s 24+1 rule is an important safeguard to keep in mind when designing your messaging. Send messaging that is of course interesting and valuable, but importantly also interactive and engaging. More on what that looks like below. The other important Facebook system in place Messenger marketers need to know about is subscription messaging, a consent for more messaging updates. 3. 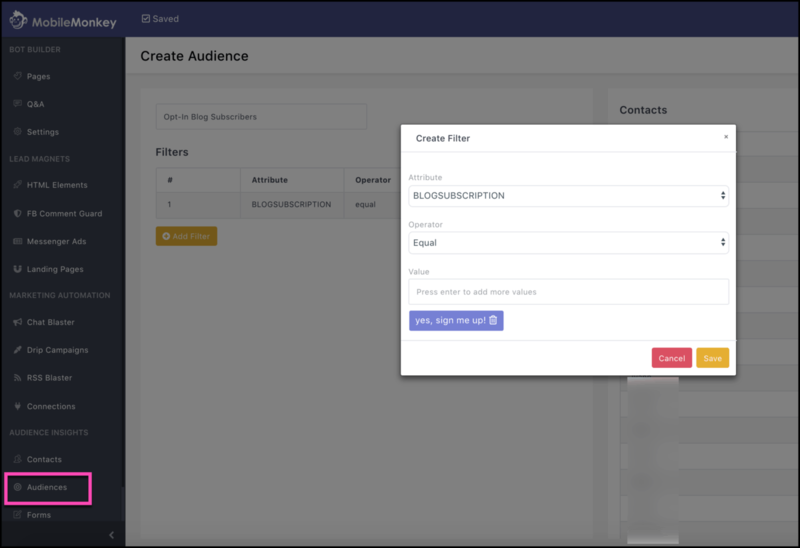 Subscription messaging: This status allows a Facebook page to send automated messages to Messenger contacts who have signed up for updates. Facebook Messenger subscription messaging is granted by Facebook at the Page level when you’ve completed a simple 5-minute application. Since the GDPR requires user consent, you should always get that consent for subscription-based updates from your contacts. 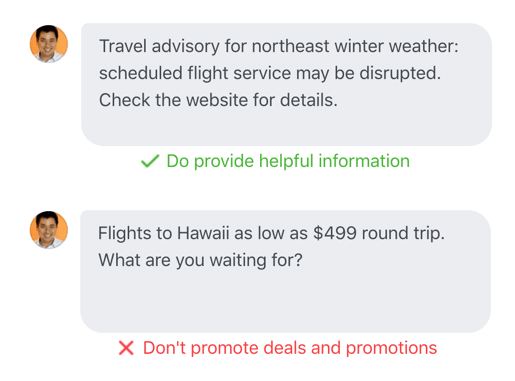 Promotional messages intended to result in a direct sale are not allowed in subscription messaging. 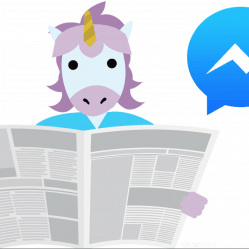 Read this to learn how to apply for Facebook Messenger subscription messaging. 4. 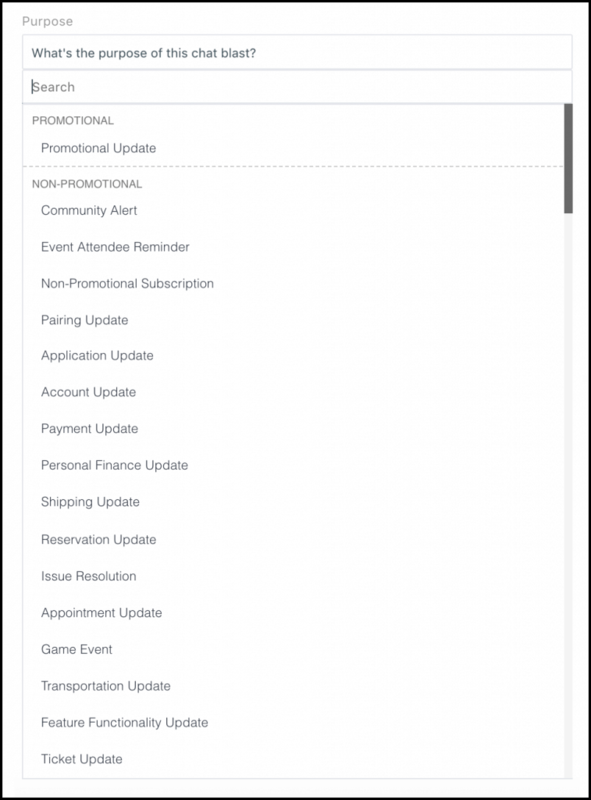 Handling unsubscribes: No need to worry about programming the unsubscribe feature in or managing contact subscriptions. 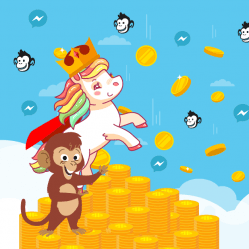 MobileMonkey handles the Facebook Messenger unsubscribe process for you out of the box. 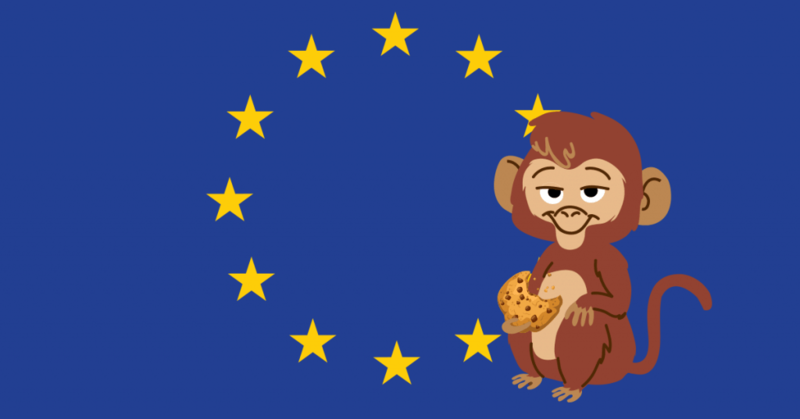 Unsubscribe is a MobileMonkey system feature and 100% Facebook Messenger and GDPR compliant in Messenger. A user just types “stop” or “unsubscribe” to a Page for the subscription menu option to pop-up. The user is unsubscribed in the MobileMonkey back end. See our best practices guide that outlines the Facebook Messenger rules in detail. 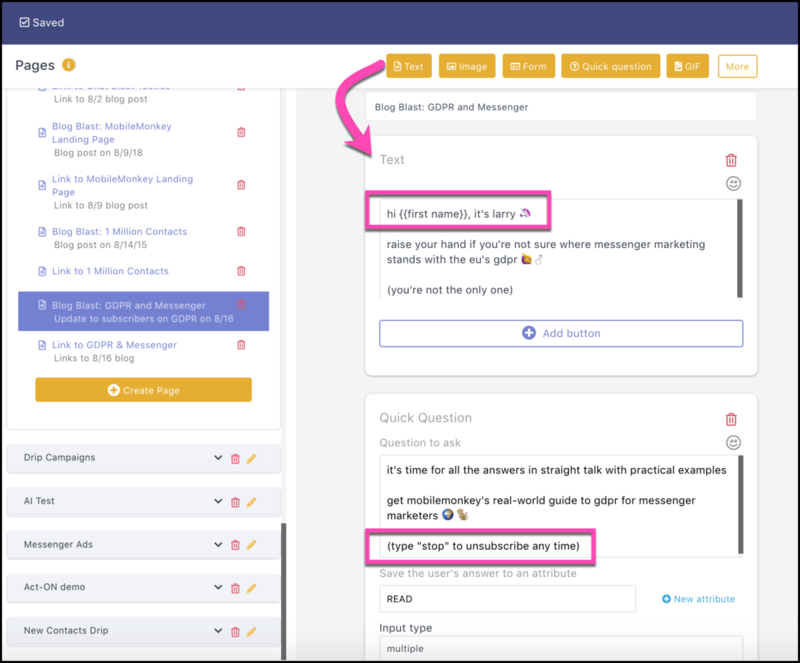 We can review the messaging rules and GDPR issues with a real-life example chat blast. 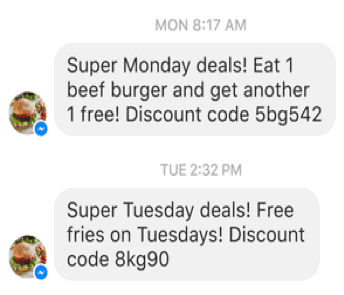 See the chat blast we’ve built for this example in Messenger here. The first message in any Messenger marketing contact comes from the individual. In order to get permission to message someone, a person has to message a business first. A user taps “Yes, sign me up!” to opt into subscription messaging. After a conversation has been initiated, you can send some content. 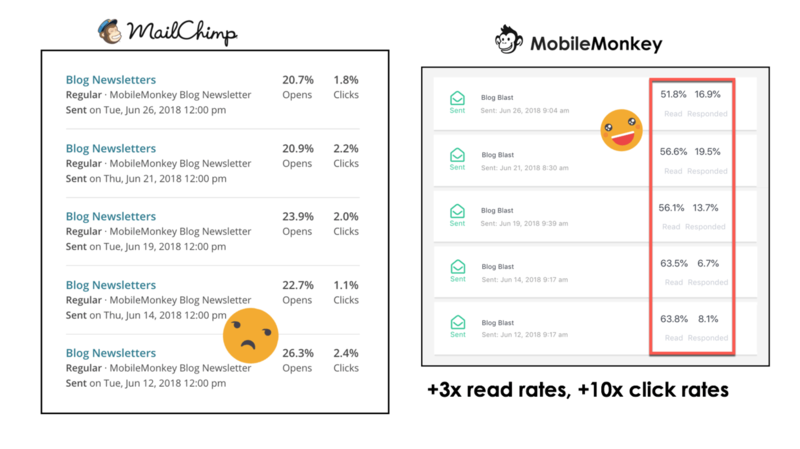 Creating content in MobileMonkey is a lot like composing an email in MailChimp. You use widgets to add content to a page, you can reorder them by dragging and dropping. The next thing you do is create a custom Messenger audience. Like in email marketing, you need a list of people to send your chat content to. What you do next is go to the Facebook Messenger chat blaster. 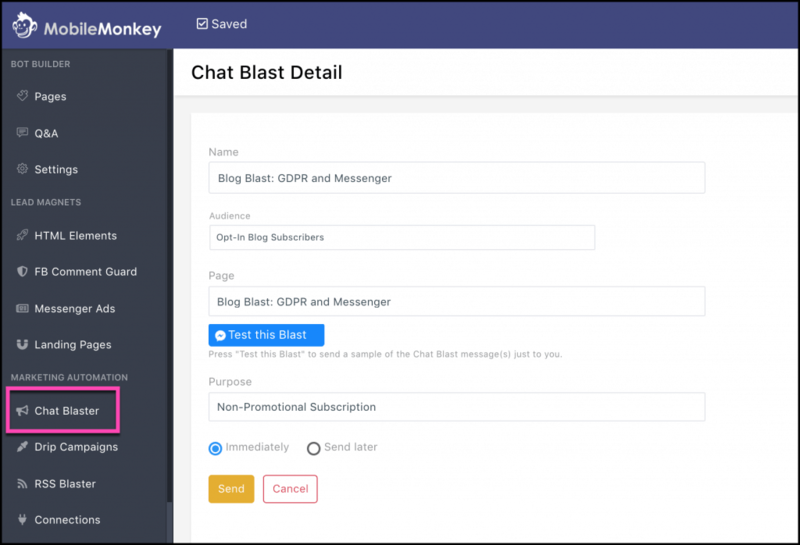 Chat blasting in MobileMonkey is powerful because chatbots can be personalized and engaging. You need to specify the purpose of this chat blast. Facebook wants to know if this is a promotional update where you’re selling something, or if it’s non-promotional. Facebook requires you describe the purpose of the messaging blast you’re sending. There are over 20 categories to select from before you hit send. Now you’ve seen how easy it is to build a chat blast. It takes just a couple minutes, you don’t have to do any coding, and it’s a powerful way to reach an engaged audience. Messenger marketing generates extremely high engagement rates and open rates. And the more engagement you receive, the more information you have as a marketer to develop more relevant and valuable content. There are built in features in Messenger that users and marketers appreciate for keeping the signal high and the noise low in the channel. For one, Messenger isn’t subject to clandestine list vendors. Services that sell email lists give email a low barrier to spammers. Thankfully, unlike email, no one can buy a list and send unsolicited messages in Messenger. In fact, in order for a business to get permissions to message someone, that person has to send the first message! No wonder the engagement rate is so high! People are messaging with companies they care about and want to get messages from. And if you get a spam email, you never know if your unsubscribe is going to be honored. With Facebook messaging, unsubscribes are overseen by a central authority that has to be obeyed. Not to mention, Messenger allows for content that is more interactive than anything you can do in email. Facebook Messenger is a golden channel for creative marketers who are committed to offering next-era content in a medium that’s personal and interactive. 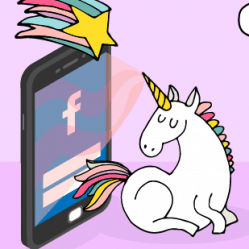 It’s a mobile chat world and savvy Messenger marketers will see unicorn-level advantages in engagement rates.